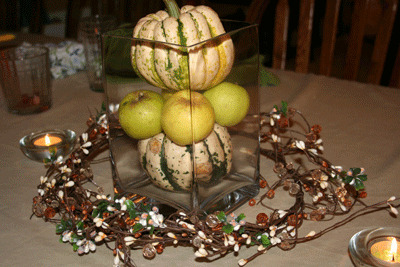 You are here: Home » Blog » Homemaking » Happy Thanksgiving! For those who may have been wondering where I was yesterday, I was celebrating Canadian Thanksgiving! This is the picture of my table centerpiece, which I unfortunately didn't think to take a picture of until after dinner, instead of when the table was first set and looking beautiful with cloth napkins, etc. I also didn't take any pictures of the spread of food, or of any people, because I was so concerned about just getting the food done and ready for everyone to eat, then I somewhat collapsed at the table as I happily ate the rewards of my labors! 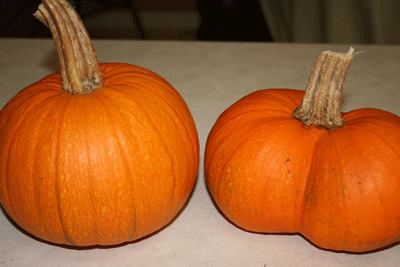 My very first pumpkins from my garden! They're New England Sugar Pie Pumpkins, and they made such a nice pie. I used these directions to make my puree, and it worked so well. I'm hoping to post about what I'm thankful for later today, but for the moment, I'm thankful for my husband who works so hard to provide for us, and I'm going to show that thankfulness by making him a lunch! Maybe this will give some of you a bit of inspiration to start thinking about your own Thanksgiving coming up in November! What do you usually serve? How does your family celebrate Thanksgiving? To the Canadians out there, how did you celebrate yesterday? Happy Thanksgiving! Love the blog. Too often I am the same way… so worried about the food I forget about capturing the moments I enjoy on film. I am a Canuck living stateside. Thanksgiving is so much a bigger holiday in the states. We had my mom come to visit, and so to work with her schedule we had a supper on Sunday. I just did a turkey breast (cut up from a fresh large turkey I got locally) as that was easiest to handle and could cook faster for a Sunday. The rest of the turkey went in the freezer (another breast for Christmas, and the rest for use through the year). I also did some wild rice, squash from the farmer’s market, carrots from my garden, a salad with carrots and tomatoes and lettuce from my garden (tomatoes have been ripening inside) and that’s it. My mom did most of the work since I am so tired. It was nice though! I love your centerpiece. I made one up of some gourds and mini pumpkins from the farmer’s market along with a bouqet my 2 year old picked of a wild daisy, aster and high bush cranberries. She loved to be included! Another year I would also love to have some people over. Glad you had a good time! Good luck with your first Thanksgiving dinner, Kelly! I’m sure it will be wonderful! Happy Thanksgiving to you, too, Kim! Dana, I can’t believe how much bigger it is in the States! It rivals Christmas, from what I can see. It’s definitely a bit more laid back here in Canada, but still a great holiday. Sounds like a lovely thanksgiving! We won’t have ours for a little while yet, but I am really looking forward to it. I am so glad that my directions for roasting pumpkins worked well for you. :-) I am going to be doing some more myself this week. My husband and I were just saying how Thanksgiving in October made so much more sense to us. He grew up in Alaska and never could figure out why we were celebrating “harvest” when the garden had been frozen solid for almost two months. Of course, living in the lower 48, a November Thanksgiving makes more sense, but it’s just fun to think about celebrating in October while my fridge is still full of local CSA veggies, I have a basket of recently picked apples and crabapples on my counter, and we’re harvesting the last of our window garden tomatoes and peppers. In Fairbanks, our church had a “Harvest Fest” in October where people brought of the fruit of the land: vegetables, berries, and meat harvested from the woods (that was the first time I ate bear). 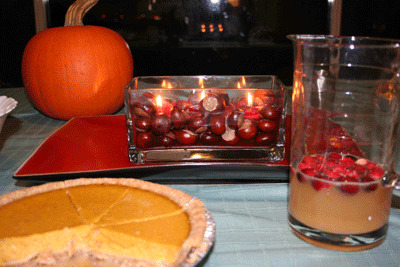 Anyway, I think your table looks lovely, and I sure wish I could have shared a piece of that pumpkin pie!